Nickel Mine Amish community. 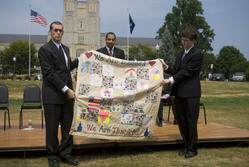 The quilt was originally made by students from St.Hilary Catholic School, in Fairlawn, Va., after the tragedy in New York City on September 11, 2001. It was then sent to New Orleans after Hurricane Katrina and to the Nickel Mines Amish School in Pennsylvania. It was accompanied by an engraved oak chest and a note that read, "The tragedy at Virginia Tech has touched the Nickel Mine community deeply and we all have prayed for each and everyone involved. Please accept the Comfort Quilt knowing that we share our love, thoughts and prayers with you." Kim Peterson, “[Untitled],” The April 16 Archive, accessed April 19, 2019, http://april16archive.org/items/show/1387.